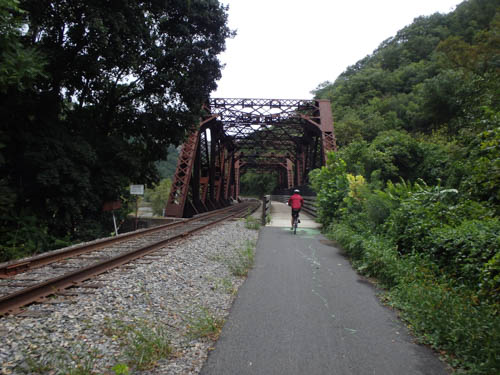 We are on our way to a Road Scholar Program during which we will ride 100 miles of the Great Allegheny Passage, a rail trail constructed on the bed of defunct rail lines running from Cumberland, Maryland to Pittsburg. Today, we are getting a head start on the program by riding a fifteen mile section that our Road Scholar group is skipping. We have reservations with a Cumberland bike shop to drive us and our bikes up to Frostburg, so that we can ride from there back to Cumberland. 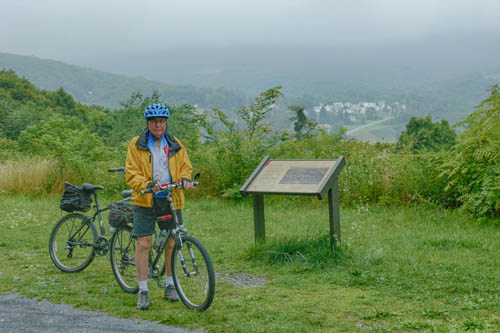 The clouds are hanging low over the mountains, and we are driving in and out of fog and misty rain as we make our way to the bike shop, but by the time the shuttle drops us off at the Frostburg rail station, where we pick up the trail, the rain has stopped and the clouds seem to at least be rising above our 1,832 foot elevation. 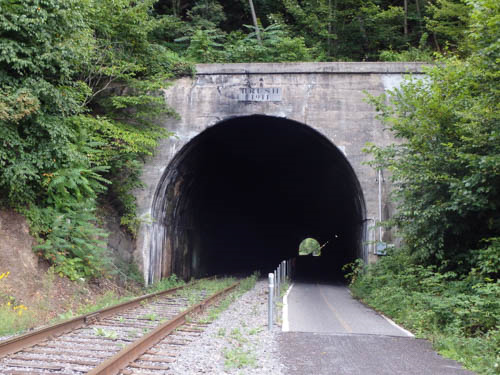 We hardly have to pedal as we make our way back down to Cumberland, 1,200 feet below. 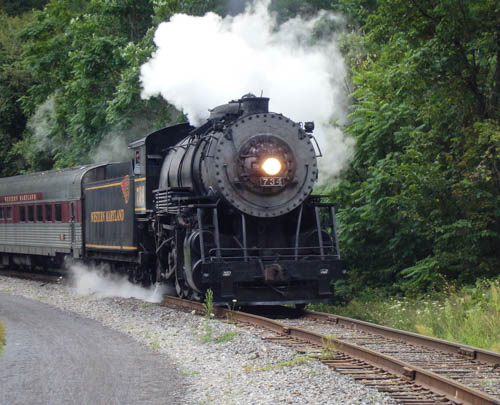 We stop to enjoy valley and holler views, to read historic markers and to watch an excursion train pulled by a steam engine puff its way up the hill past us and into the long tunnel we had just ridden through, leaving billows of sooty black smoke pouring out the tunnel behind it. Another highlight of the trail is the Cumberland Bone Cave discovered in 1912, where scientists subsequently unearthed the remains of 40 mammals--28 of them extinct--some up to 200 years old. We couldn’t go in the cave--we could just see the entrance, but it was exciting to think about what a rich fossil discovery lay right here beside the tracks. There were lots of other caves carved in the limestone along the rail bed--who knows what other bone caves may remain unexplored around here? Near the end of our ride, we pass through The Narrows, a passage where tall cliffs rise on both sides of the road. A trailside marker tells the tale of a Lover’s Leap where a young Indian woman and a white man fall in love and jump to their deaths when her father, the chief of the tribe will not let them marry. 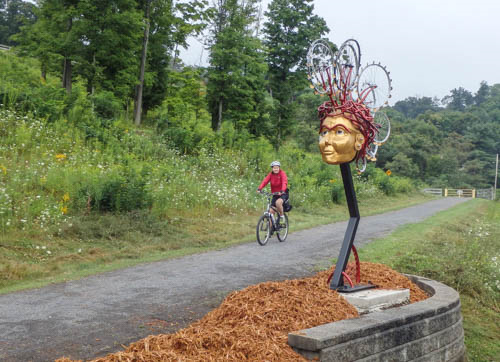 In our short ride down the mountain, we have enjoyed some art, and learned some natural and social history, geology, and mythology, all in fifteen easy pedaling scenic miles. 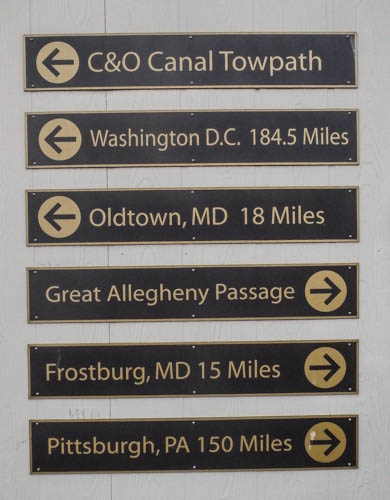 The Cumberland bike shop is located at the point where the GAP Trail ends and the C&O Canal Trail begins, and there is a big park area around the remains of a canal bed near the shop. The place is hopping--a band is playing on a temporary stage, kids in matching tee shirts are arriving to do some sort of performance, and crowds of people are converging on the field, despite the intermittent misty rain and overcast skies. We secure out bikes on the back of the car and walk a few blocks to Cumberland’s Main Street, now turned into a pedestrian mall, at least for a few blocks. We have an outstanding lunch (who knew we could build such an appetite coasting downhill? ), then are on the road again. 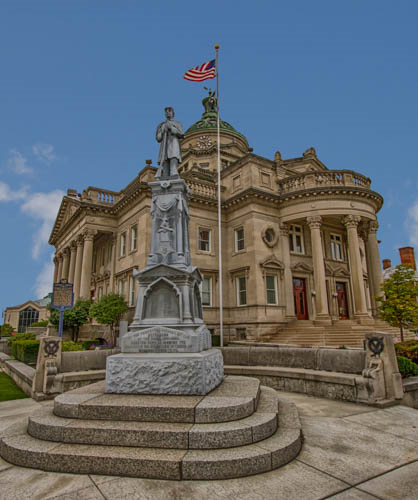 Our backroads route north takes us through lots of small towns, but when we hit Somerset, PA, the county courthouse is so striking that we have to stop for a closer look. In front of the courthouse stands this Civil War monument erected in 1888 to honor “those who died defending the Union.” There are separate panels for those killed in battle and those who died of disease. Those killed in battle outnumber those who died of disease, but not by a very big margin. We are only a little bit surprised to learn this. We get another history lesson in Berlin, PA, where we stop to find a virtual geocache at the home of the leader of the 1794 whiskey rebellion in Berlin PA. When the still very new Federal Government attempted to raise funds by taxing whiskey in 1794, local merchant Robert Philson raised a liberty pole and encouraged his fellow citizens to join him in not paying the tax. President Washington responded by sending troops to quell the rebellion and arrest Philson. His criminal record seems not to have diminished his standing in Berlin--after his release he went on to serve as a county judge for twenty years and be elected to Congress. And to this day, Berlin honors his memory with an annual Whiskey Rebellion Celebration.